An unusual and attractive 1829 map of the ancient empires of Mauritania, Carthage, and Numidia. Depicts what is today known as the Barbary Coast around 200 BC. This map illustrates a crucial turning point early in the Second Punic War. The Carthaginian Empire dominated much of the region, until Numidia, the Kingdom to the west of Carthage, allied itself with Rome in 206 BC leading the Roman conquest of the region in 201 BC. Exhibits the typical detail and scientific precision of Lapie maps. Notes various trade routes, topographical features, and Oases. Prepared as plate no. 14 for the 1829 issue of Lapie's Atlas Universel de Geographie Ancienne et Moderne. 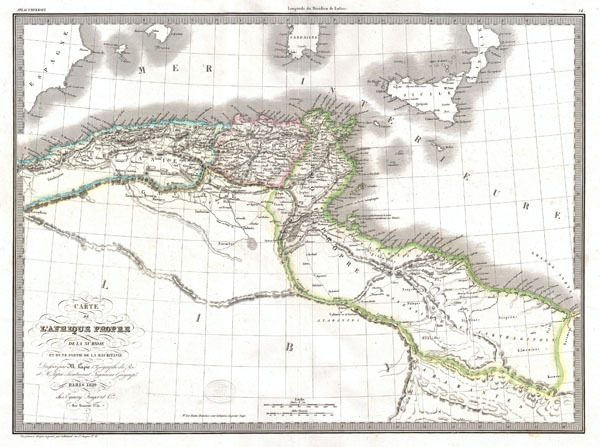 Lapie, P. and Lapie, A. E., Atlas Universel de Geographie Ancienne et Moderne, (1829 first edition). Very good condition. Original pressmark visible. Wide margins. Blank on verso.